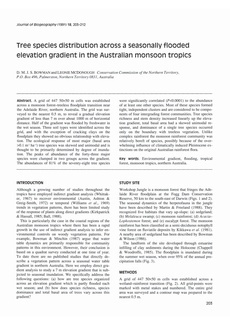 A grid of 447 50x50 m cells was established across a monsoon forest-treeless floodplain transition near the Adelaide River, northern Australia. The grid was surveyed to the nearest 0.5 m, to reveal a gradual elevation gradient of less than 7 m over about 1000 m of horizontal distance. Half of the gradient was flooded by freshwater in the wet season. Three soil types were identified across the grid, and with the exception of cracking clays on the floodplain they showed no obvious relationship with elevation. The ecological response of most major (basal area >0.1 m2ha-1) tree species was skewed and unimodal and is thought to be primarily determined by degree of inundation. The peaks ot abundance of the forty-three major species were clumped in two groups across the gradient. The abundances of 81% of the seventy-eight tree species were significantly correlated (P<0.0001) to the abundance of at least one other species. Most of these species formed tight, independent clusters and are considered to be components of four intergrading forest communities. Tree species richness and stem density increased linearly up the elevation gradient, total basal area had a skewed unimodal response, and dominance of a single tree species occurred only on the boundary with treeless vegetation. Unlike complex rainforest the monsoon rainforest community was relatively bereft of species, possibly because of the overwhelming influence of climatically induced Pleistocene extinctions on the original Australian rainforest flora.